The holiday season inspires every shade of red; from a deep, robust red to a rich, bold, ruby red. A color of passion and power, red adds a new dimension and explosion to your living space. Red is a demanding color that stimulates appetites; a reason why it is used in dining rooms. Dark, wine Cabernet colors like “New London Burgundy” by Benjamin Moore, make large rooms seem cozy and can be dramatic in small spaces like powder rooms. 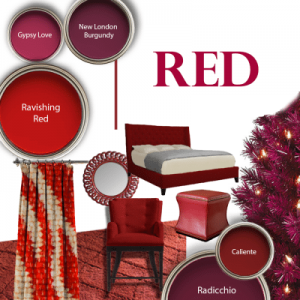 “Ravishing Red” is a bold and saturated hue; part of Benjamin Moore’s Color Trend 2016 collection. This color is sure to bring energy to a room and is very powerful when purposely used with black and white. “Caliente”, a ruby red color by Benjamin Moore, is a stimulating lively hue that can be used on one wall in a room as an accent or as ‘pops’ of color in fabrics or accessories. Add white to red, and you have a pinkish-red such as “Gypsy Love” by Benjamin Moore. Its glamorous and feminine, in all its sassy shades. It can be used in teenage rooms or living and dining rooms when building a sophisticated country style. Radicchio, which is in the berry family by Benjamin Moore, is the right fit for a old Georgian colonial home. Living rooms tend to be over stated with a lot of moldings and French doors that pour in a lot of light. The Radicchio is a strong, deep color that keeps a traditional warm welcome; making large rooms feel soothing and cozy. Color itself is like one of the senses; enhancing our world and state of mind, color can bring about a transformation – energy, refreshing, calming, expanding or warming our space. Using color at home, in a decorated scheme can be a bit of a balancing act. This is why it’s important to select the color that’s just right for your home.